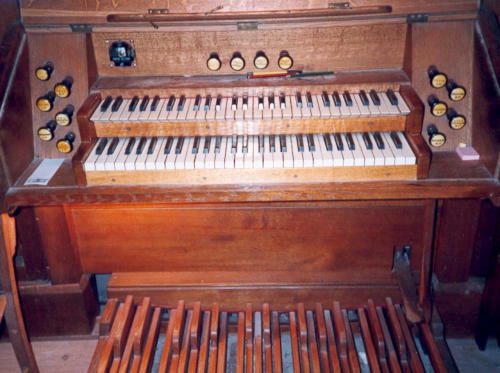 Following a report by Eric Pask, the Diocesan Organ Advisor in 1992 it became obvious that either the organ needed a major overhaul or complete replacement. Following the consideration of options a replacement by a new or refurbished instrument was considered the best solution. An experiment was also initiated for a new position in the East end of the South Aisle to overcome the problem of communication with the choir and alleviate over-warming by the new heating system. A small house organ loaned from the diocese was used for this experiment following the moving of the pulpit to the North Side. Peter Wilks, a long time enthusiast of St. Peter’s musical tradition had recently died and bequeathed a sum of money to start an organ replacement fund. 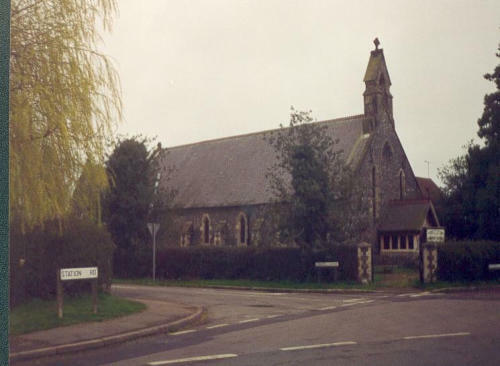 Following a few years of experiment, searching and fundraising, eventually an organ became available from St. John’s Church, Letty Green near Hertford which was being made redundant. It was considered suitable both in size and condition to be installed in the new South Aisle position. 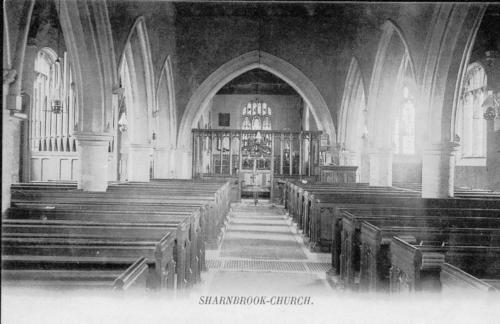 Accordingly Robert Shaftoe, the local organ builder from Pavenham was commissioned to carry out the work. 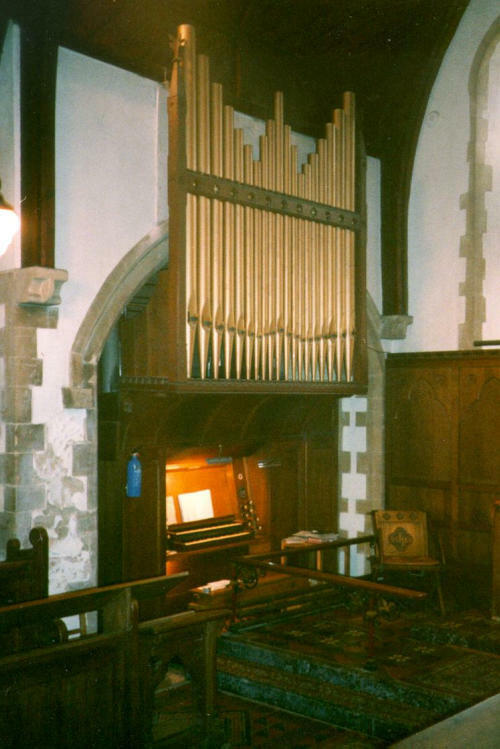 This organ had been originally built by J. W. Corps and installed in Letty Green in 1889 at a cost of £260. James .W. Corps, born soon after 1800, was apprenticed to the firm of Flight & Robson, builders of the ‘Apollonican’ and also small barrel organs. It appears that he stayed with them until the break-up of the partnership in 1832, joining another firm after this. By 1839, he was working on his own, advertising barrel organs from 40 guineas and finger organs from 50 guineas. Corps set up in Reading, appropriately for his name, with an undertaker, and did work at St Giles (a contract which he gained from Bishop & Starr) and St Lawrence. By 1847 he had left Reading but was doing business in Norwich; in 1853 his letterhead contained Hampstead. The organ had been overhauled at St. Johns with tonal changes by Peter Collins around 1970 and a balanced swell had been added. 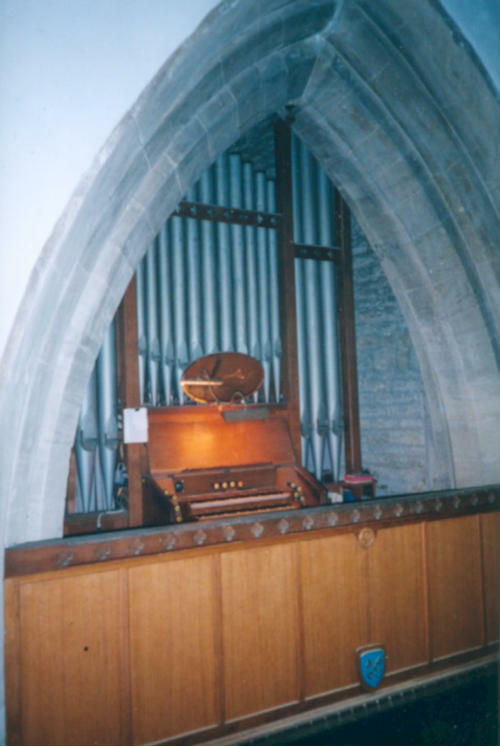 During the summer and cold winter of 1999 Robert Shaftoe completely refurbished the whole organ and it was installed in St. Peter’s and dedicated by the Archdeacon of Bedford on April 12th. 2000. Eric Pask gave the inaugural recital. During 2001 the old Trustam organ was recovered from the west gallery revealing the newly refurbished west window and restoring the 'Musicians Gallery' that the choir have made use of at our recent Christmas Carol Services. These 19 front pipes are just part of of one rank (Great:Open Diapason). 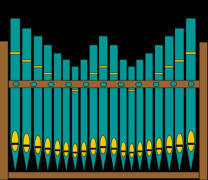 The organ contains 11 ranks and approximately 600 pipes. All sponsorship is recorded in a book kept in the organ case. Peter Sagrott, Peter Wilks, Audrey Edwards and David Deeley have also assisted at evensongs and other services during the last 40 years.